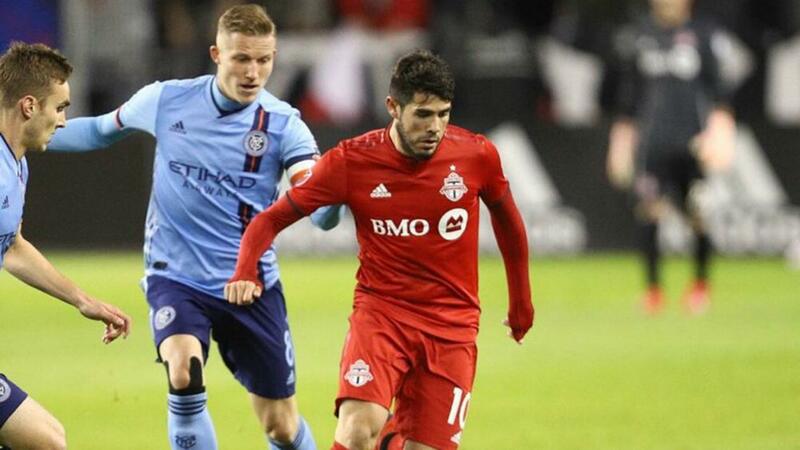 Alejandro Pozuelo produced a masterclass of skill on his debut to inspire Toronto's 4-0 demolition of New York City in MLS on Friday. Pozuelo scored twice – both incredible chips – in his first appearance as Toronto preserved its 100 per cent record after the opening three matches of the season. Toronto led 1-0 at half-time on home soil thanks to Altidore, who side-footed past NYC goalkeeper Sean Johnson approaching the half-hour mark. Pozuelo – brought to the club from Belgian side Genk as a replacement for Sebastian Giovinco – set up Altidore for the opener. And, the former Real Betis and Swansea City attacker got in on the action two minutes before the hour via a sublime 'Panenka' penalty. Pozuelo made it 3-0 with 12 minutes remaining when he audaciously and nonchalantly chipped the goalkeeper from just inside the penalty area, sparking wild scenes. Jay Chapman came off the bench to replace Pozuelo and capped the scoring in the 83rd minute as New York was left still searching for its first win of the campaign.